One of my favorite #oppositelock games is #DDTrackBurn, which implies you'll get three choices and you have to pick one to daily drive, one to take to the track, and one to burn. 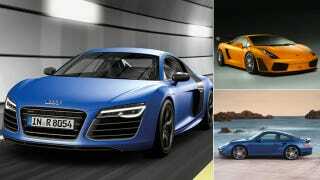 In his review of the 2013 Audi R8 Travis mentioned that the R8 V10 is competitive with the Lamborghini Gallardo and Porsche 911 Turbo. Get to it: DD, Track, Burn. All VAG.